New Last Jedi Valentine's Day Cards Pack now available! New Last Jedi Valentine’s Day Cards Pack now available! 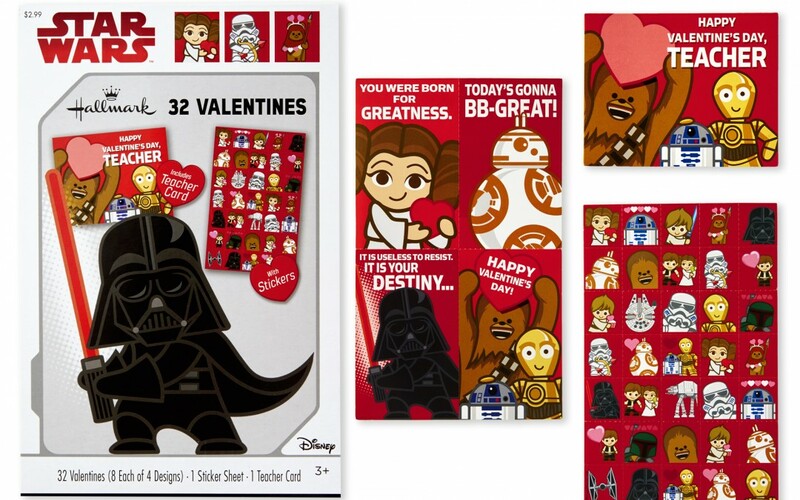 Walmart has debuted a new Last Jedi themed Valentine’s Day cards pack! This pack costs $2.48 and shipping is free. Kids will be thrilled to hand out these Star Wars Valentine’s Day cards to all their friends (and their teacher!) at their classroom exchange. 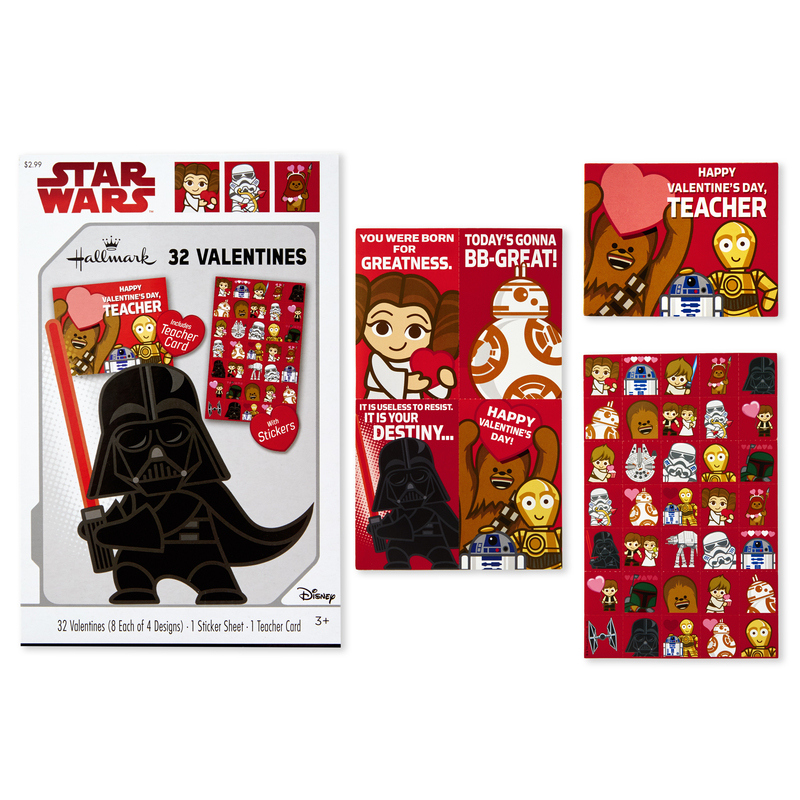 Featuring awesome designs of favorite characters like Darth Vader and Chewbacca, a sticker sheet for decorating cards or their mailbox, and festive messaging, this Valentine’s kit is sure to be a hit with the elementary school set. For more than 100 years, Hallmark has been helping its customers make everyday moments more beautiful and celebrations more joyful. 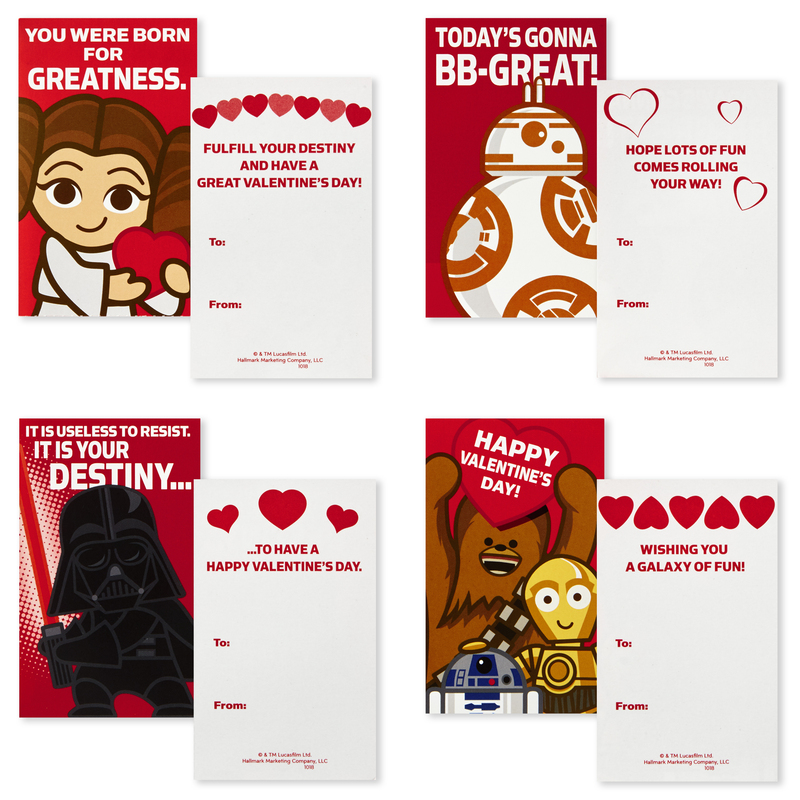 Perforated, tear-apart Valentine’s cards, teacher card, and a sheet of 35 stickers have modern designs featuring Yoda, Darth Vader, R2-D2, Chewbacca, Han Solo, Luke Skywalker, C-3PO, Boba Fett, Stormtroopers, and more. Delight all your friends at the classroom exchange with four assorted designs and unique “Happy Valentine’s Day!” messages. Pack includes 32 valentines (8 of each design), one teacher card, and one sheet of stickers for personalizing cards or your Valentine’s mailbox. Valentines measure 2″ x 4″, and teacher’s card measures 2.5″ x 3.25″. Printed on high quality paper stock, Hallmark’s eco-friendly stationery is made with paper from well-managed forests.